'Don't cry over spilt milk' to mean don't waste your time worrying or getting upset about small mistakes or accidents: they cannot be changed. I know you're angry about missing your bus but don’t cry over spilt milk; another one will be along soon. John's decision to resign was disappointing, but it's no use crying over spilt milk – let's concentrate on finding someone to replace him. We say 'don't cry over spilt milk' to mean don't waste your time worrying or getting upset about small mistakes or accidents: they cannot be changed. In English you say 'don't cry over spilt milk'. In Turkish we say Üzülme, incir çekirdeğini bile doldurmaz – which means it is as small as a seed from a fig. In English you say 'don't cry over spilt milk'. In Arabic we say لا تفكر في المفقود حتى لا تفقد الموجودwhich means, there is no point really thinking about things that have gone wrong or you lost them, it's better to focus on the future, opportunities and have a positive energy looking ahead rather than looking backwards. In English you say 'don't cry over spilt milk'. In Chinese we say 覆水难收 which means the water you spilt is impossible to get back. So, there are a few examples of 'don't cry over spilt milk' in other languages, what do you say? In Turkish - Üzülme, incir çekirdeğini bile doldurmaz – which means it is as small as a seed from a fig. In Arabic - لا تفكر في المفقود حتى لا تفقد الموجودwhich means, there is no point really thinking about things that have gone wrong or you lost them, it's better to focus on the future, opportunities and have a positive energy looking ahead rather than looking backwards. In Chinese - 覆水难收 which means the water you spilt is impossible to get back. Is someone wasting time worrying or getting upset about small mistakes or accidents that cannot be changed? So what if you didn't get full marks, you've still got the place you wanted at university - don't cry over spilt milk! So you crashed the car and now you have to get a taxi everywhere? 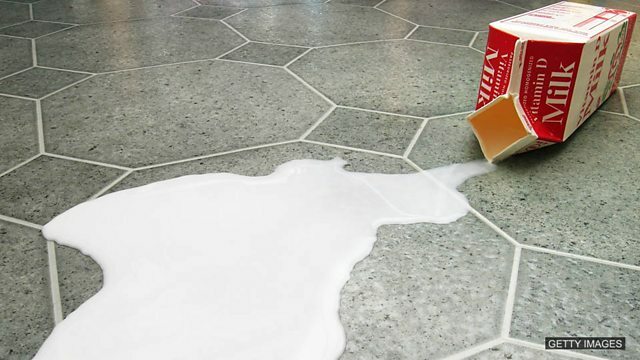 Don't cry over spilt milk!